To increase the drama and add interest to your dark floor, try using tile in different shapes and patterns. Choose shapes like hexagons or circles or try unique patterns like herringbone. A contrasting grout will also help set off the design. 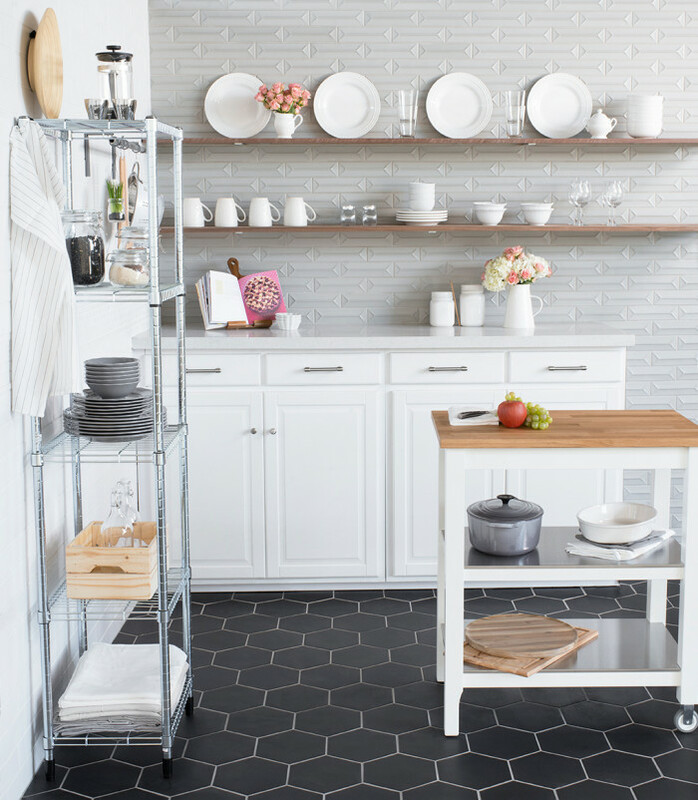 In this space, we paired bright white cabinets, quartz countertops and wall paint with a black hexagon floor tile. The dark base makes the other elements stand out. 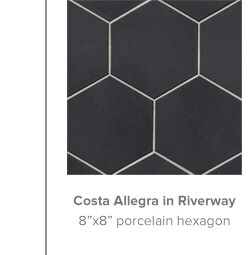 We used a light grey grout to further define the shape of the hexagon tile. The soft grey of the ceramic tile backsplash helps tie in the black floor. 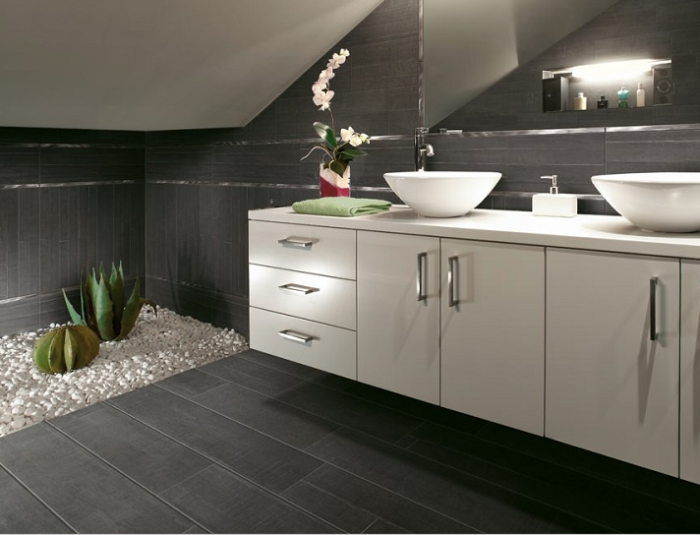 Dark grey tile in the bathroom sets a dramatic stage for white tiled walls. Bring the darkness up off the floor with a black or grey counter in quartz or granite, black matte faucets, lighting and window trim. For this room, we chose our new Woodmark wood-look porcelain 6"x36" plank tile in Anthracite. The contrasting grout really sets off the herringbone pattern. 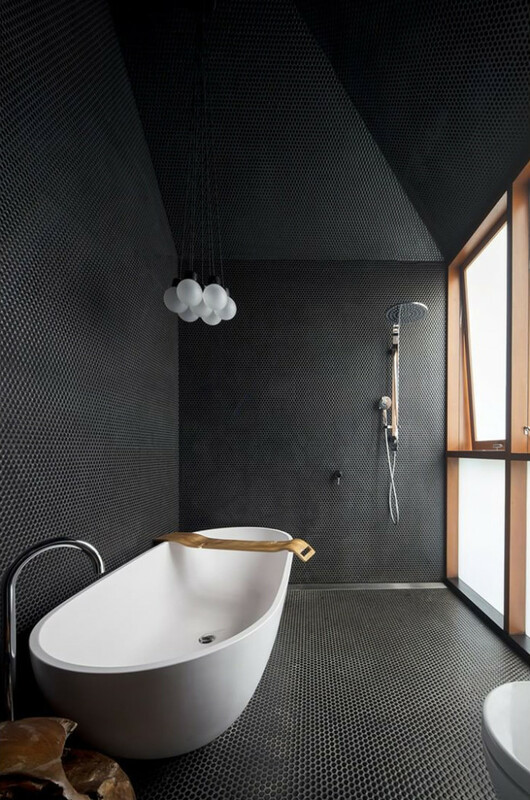 For an intense and dramatic look, tile your shower, floor to ceiling, in black or grey with matching grout. 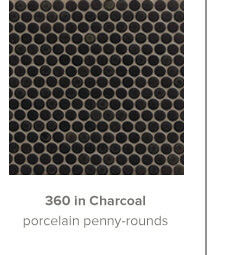 Achieve this enveloping feel with our penny round porcelain tile collection called 360 in the colors Charcoal, Iron or Shale. 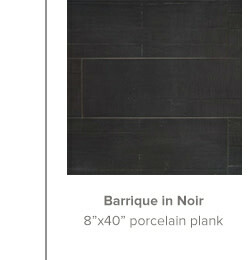 For more classic looks, try plank size wood-look tile in dark colors. 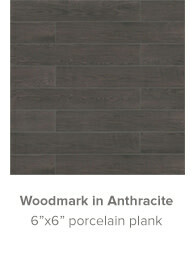 Ranging from warm browns to cool greys, get the look of hardwood floors, but with the easy maintenance of porcelain. Tile the floor, tile the wall! 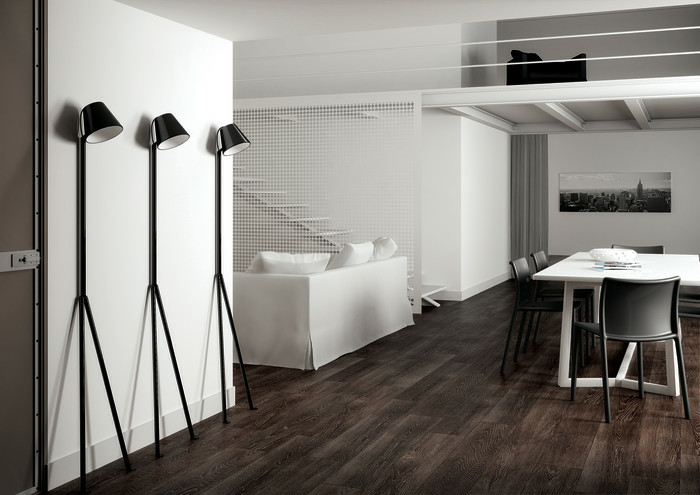 This room is covered in our matte Barrique wood-look in Noir, in multiple sizes. 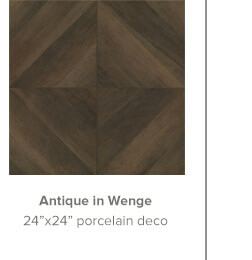 The designer paired the long, wide 8"x40" planks with thin 4"x40" planks, and for more interest, added in the 4"x24". The matte tile finish contrasts with the silver metal accents for a sleek, modern look. 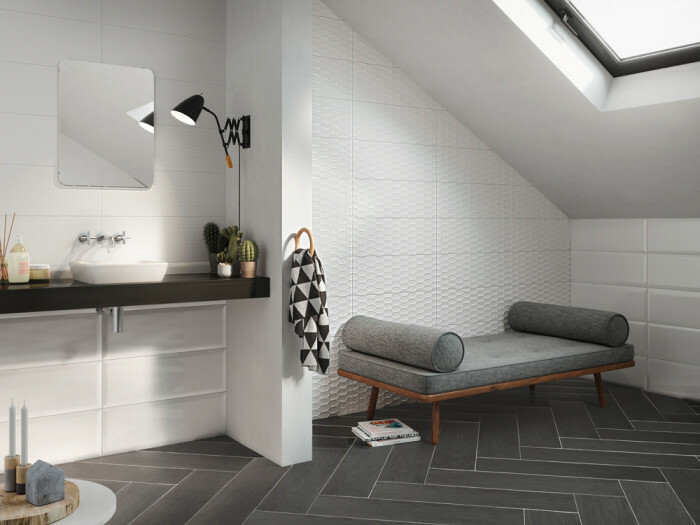 Mod espresso brown tile lets the white in this room pop, creating a fresh, open feel. 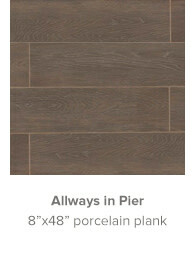 Achieve this look with Allways wood-look porcelain in the Pier color. 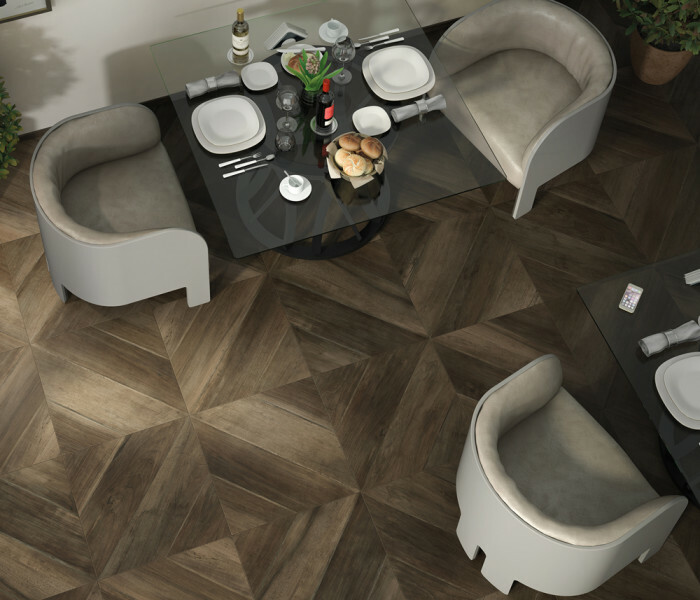 Drawing inspiration from antique wood, this parquet-look dark floor makes for an elegant and refined space. 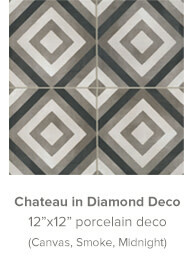 Our Antique Collection offers a 24"x24" diagonal pattern creates large diamonds when four pieces are laid together. 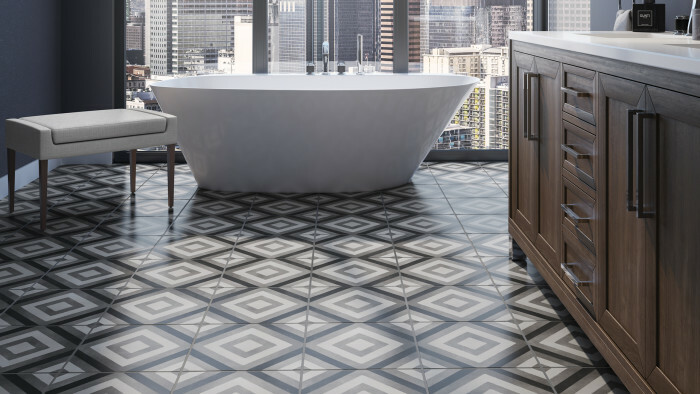 Patterned tile is all the rage and the dark options deliver the most drama and impact. 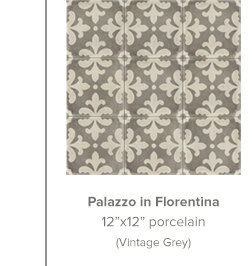 Available in porcelain and cement, graphic tile says a lot about your personality and style. This dark kitchen floor is the picture of cozy. It creates a shabby chic atmosphere where anyone will feel at home. 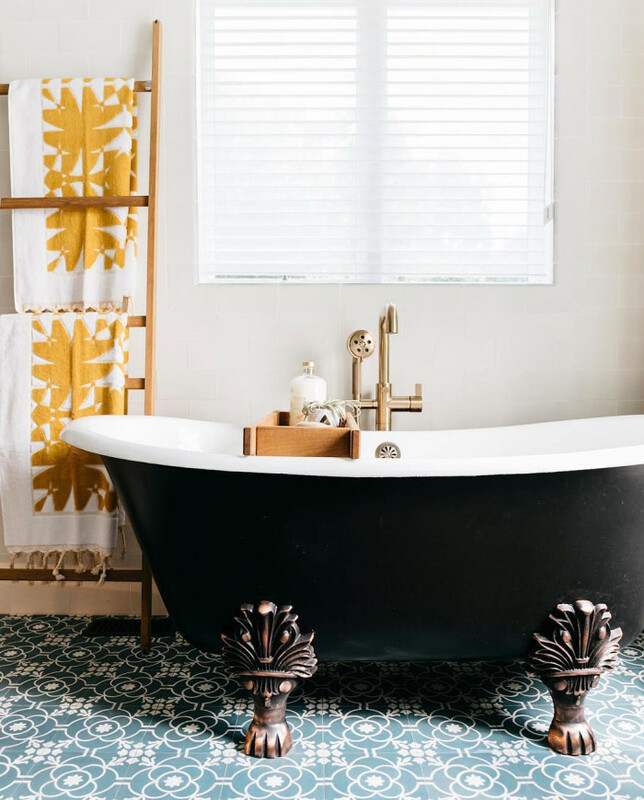 The overall effect of this dark bathroom floor is mesmerizing as you get lost in the diamonds. The straight lines are clean and symmetrical, creating a contemporary appeal. You don't have to just do black, grey or brown to give a dark base to your room. 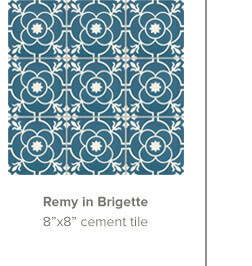 This dark aqua blue tile, which is Remy 8"x8" cement tile in the Brigette pattern, adds another level of intrigue to this bathroom. Specific cleaning and maintenance requirements vary depending on the tile’s surface and texture and any present contaminants. Below are some general cleaning and maintenance guidelines for dark floors. To minimize footprints, wear socks on the floor. Remember to seal your cement or natural stone tile with a penetrating sealer prior to grouting. 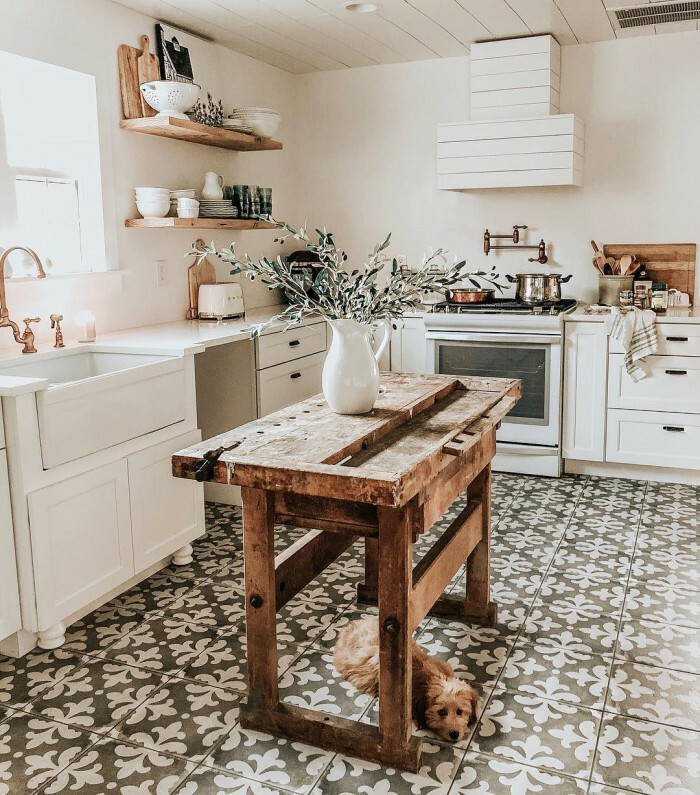 Sweep or vacuum the tiles daily to avoid hair and dusty bunny build up (that tends to stand out more on dark floors). Clean the tiles regularly with a pH neutral cleaner and rinse with clean water. Use only neutral, non-abrasive and non-acidic cleaners. Avoid use of any harsh cleaning products that contain bleach or acidic chemicals. Acid-based cleaners and harsh chemicals may etch the surface of the tile, especially tiles with polished or honed finishes. It is important that the cleaner is a non-oil, non-soap and non-animal fat based product. These products act like a magnet, attracting dirt and dust. Always test cleaning solutions on a small inconspicuous area before proceeding to clean the entire surface area. For hard to remove residue, a single disc floor machine with a white pad may be used. Be sure to wet the surface first when using a floor machine.